Rob Provost is founder and owner of Grand Slam Fly Fishing Destinations, LLC. With well over 20 years of fly fishing experience ranging from New England to New Zealand, Rob has been fly fishing in saltwater (most notably Hawaii and the Caribbean) for almost a decade. Rob retired as a Lieutenant Colonel in the United States Air Force after 20 years on active duty. He was the featured guest on the 2004 episode of Hawaii Sportsman TV, entitled Bones on the Fly - where he was one of the very first to introduce locals and the business/vacation traveller alike to the pursuit of Hawaiian bonefish on the fly. Rob Provost was one of the very first to introduce locals and the business/vacation traveler alike to the pursuit of Hawaiian bonefish on the fly. Listen in to learn about fly fishing for bonefish and how it differs from other places in the world. Rob also appeared on a episode of Fly Fishing The World entitled Hawaiian Bonefish and Peacock Bass with host Conway Bowman. Rob and Conway fished for bonefish on the fly on the islands of Oahu and Molokai, and caught Peacock bass and Smallmouth bass on Lake Wilson - a freshwater reservoir on Oahu. He is a lifetime member of Trout Unlimited and regularly gives educational presentations on fly fishing in Alaska, Hawaii, New Zealand and other world-renowned destinations. 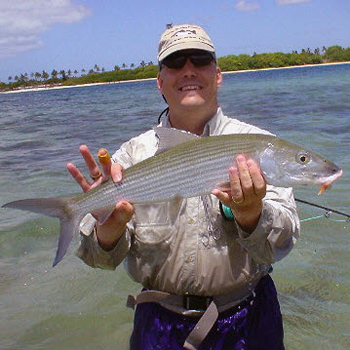 His most recent presentation, entitled "Bonefishing in Paradise: Fly-fishing for Bonefish in the Hawaiian Islands" can be seen in Destination Theater at select venues of The Fly Fishing Show, and upon request. Rob is the president of his local Trout Unlimited chapter and a volunteer for Project Healing Waters Fly Fishing and Casting For Recovery. Rob's company, Grand Slam Fly Fishing Destinations, also provides guided fly fishing trips for bonefish, trevally and Rainbow trout on the island of Kauai and also hosts trips to Alaska, California, Louisianna, the Bahamas, Belize, Brazil and New Zealand. Fly fishing is one of his many passions, along with drumming, golf, tennis, wine ... and (most importantly) his beautiful wife, Cindy.